I´m glad to announce that we have just updated our detection software and that our Theme Detector works even better now, being much more effective when it comes to child theme detection. 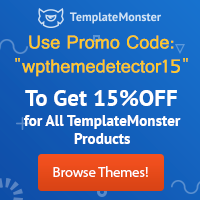 We had noticed that in some cases of websites using a WP child theme our detection tools only found the parent theme while missing the child theme. This was particularly true for sites where the parent theme stylesheet is enqueued as it is currently considered best practice. So we went through our whole detection code, identified the possible causes for some child themes not being detected and then developed new software to avoid that kind of issues. Our detection tools rely on several different detection strategies. When one of them is not able to detect the active theme on the investigated site, the system launches the following one and so on until either the theme is detected or we run out of detection strategies. Well, we found that the new code we developed for this update works so well that we have added it not just as a new detection strategy, but as the first one to be run for every website search. We finally deployed the new code on the live site at the end of last week so now, after the appropriate testing, we are ready to let you know about the improved performance. While in this case other tools will just be able to detect the Stargazer parent theme (or to even just tell you that WordPress was detected but the specific theme details could not be determined! ), our software will detect both the WordPress Tavern Theme child theme and the Stargazer parent theme. 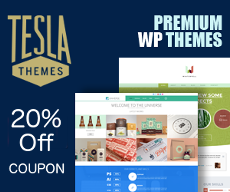 Our tool will also give you a lot of details about the themes and their providers. For instance, in the WPTavern example shown above it identifies the child theme as a custom and proprietary theme (therefore not available for you to download or buy), and it includes separate sections with all kind of details and links not only for the parent theme, but also for its provider (Theme Hybrid in this case). WPThemeDetector is always under continuous improvement. I hope you all enjoy it! It was working fine until recently. Did the latest Windows update cause a problem? What do I need to do to make it work again? Thank you Erin. It´s fixed. There was an error on a maintenance modification of a php file. Why You cannot detect many website’s theme. One question, is it possible to hide the plugins to be listed by this site? 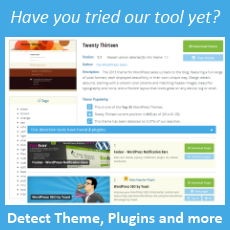 Sadly for most of the themes, this tool says — Theme details doesn’t found. Our tool detects it without any problem. It´s just a custom theme. Continuous improvement and dedication towards any work is always appreciated by all. Congo for your new detection strategy! It,s Work Perfect for me, Thanks man for making that more good. It Work Perfect for me, Thanks man for making that more good. Hope for more such great and fine working updates. You were need it. Thanks to provide such improvement. I hope the updates are clean and don’t cause future problems, right now it’s very good. 10 plugins detection isn’t enough try to give more so that users can get something extra. It will be better if we can get details of CMS of any site in case that’s not WordPress. Is this tool really works? For sure it works…its a great research and amazing child theme detection. Really amazing child theme detecting software. Great work.